George Brauchler and his political strategist. 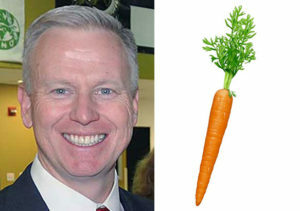 George Brauchler has the political instincts of a carrot. Last month, the Arapahoe County District Attorney and Republican candidate for Attorney General made the bizarre decision to publicly attack a potential witness in an execution case after a woman refused to participate in the trial due to her religious beliefs. Brauchler was so caught up in his bloodlust over death penalty cases that he was oblivious to the fact that the entire episode just made him look like a Republican opposing religious freedom. Brauchler was quickly attacked on social media for his idiotic Tweet — a problem he then compounded by getting into heated discussions with people responding to his message. It is particularly absurd for Brauchler to question the timing of teacher complaints about low wages; after all, this is the same guy who used to talk about how he once asked for a pay cut without bothering to mention that he had later requested — and received — a huge salary increase. We can’t understand Brauchler’s thought process here, because this is fundamentally a very simple thing: If you are trying to win a statewide race for any office, attacking teachers is about the last thing you want to do. Ever. Brauchler was once thought to be a potential candidate for U.S. Senate, but he skipped that opportunity in order to make a run for Governor in 2018. Brauchler’s gubernatorial hopes fizzled out in a matter of months after it became clear that he had absolutely no idea how to mount an effective statewide campaign; when Attorney General Cynthia Coffman announced her own no-hope bid for Governor in November, Brauchler quickly changed trains to run for AG himself. In his brief run for Governor, Brauchler showed that he couldn’t raise money and had no grasp of how to talk about issues (Brauchler was famously surprised to find out that water was a big issue in Colorado). While he has been running for various statewide offices, Brauchler has also proven to be pretty terrible at his current gig, which doesn’t help his argument that he should become Colorado’s chief law enforcement officer. Some politicians just can’t ever seem to get out of their own way. George Brauchler is exactly that kind of politician. Is Jon Keyser his campaign chair? I can’t tell for sure what that little thing is . . .
. . . or Yammy’s 3rd pinky? Brauchler is probably the best man the Colorado GOP has. Yep, things are that bad in Redlands. I sorta thought it was a contest to find someone who looked a great deal like Cory Gardner, able to smile with many teeth as he makes a way through nearly every sort of situation and say things in an appropriate, non-binding, non-antagonizing manner. Now, I'm not certain what the appeal is. I've met a few other Republicans who have gone to candidate school and seem to avoid regularly scheduled gaffes, are able to raise some money, and don't duck in and out of races. Other than pure tribal loyalty, I'm not certain what Republicans are going to point to as Brauchler continues to appeal for votes. "Most parents like me…" what a dickwad attempt to define himself as the majority. I guess he is fired up to brand it a nefarious union conspiracy. Blame those dang Christians, Broccoli. They made me take off tomorrow. (comp day for Good Friday during spring break). I must protest. See ya at the Capitol!